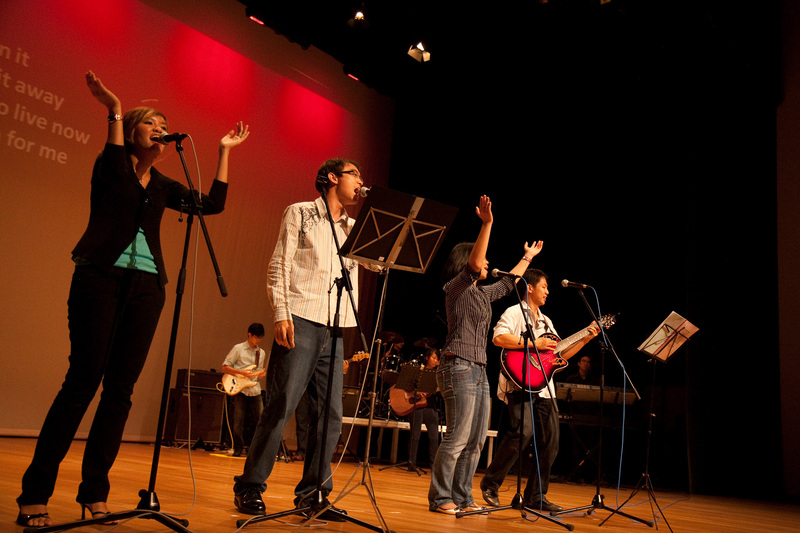 I think every Christian can understand the idea of singing to and for Jesus. Through song we praise and worship our Lord and Savior. Walk into any Christian church on a Sunday and you’ll find the congregation (and choirs, if applicable…though usual) singing hymns and songs praising the glory of God. And praise God that we’re able to hear such songs outside the walls of our churches. One of the ways we can do that is through the radio. I know of several Christian/family radio stations here in north Texas. Obviously, in order to fill the air waves with Christian music…you need Christian music artists. And I’m sure we can list all our favorites! From what it seems like to me (and I could be wrong), a lot of Christian music artists also double as worship leaders. And by “worship leader” I mean they lead congregations/groups of people in worship of our Lord through song whether they’re singing/playing solo or with a band. He who sings well, prays twice. (though apparently he didn’t really say that exactly, but…that’s a famous mis-quote). So if Christian music artists and worship leaders help bring our focus and attention towards God through song, and then there’s that whole Gospel-according-to-Matthew idea about Jesus being present whenever two or more are gathered in His name…then yes, combining these two help bridge our prayers to Jesus, Who is present because two or more are gathered (unless our churches consist of only 1, =P). What would it look like if I were to take a famous Christian artist/worship leader leading a large congregation, and place that artist/worship leader, hypothetically, in front of Jesus Himself? Like, Himself in the flesh. Like, able to reach out and touch. Would the focus of the Christian music artist/worship leader be different? Would we, the congregation, have a different, perhaps more profound, sense of our praise and worship knowing that Jesus is truly there in front us? I think that YouTube video helps answer that awkward question. So yeah, I was there on the beach! So was Jesus. So was Pope Francis. So was Matt Maher. So were 3+ million of my fellow Catholic brothers and sisters. I think the lyrics of Matt Maher’s “Lord I Need You” really resonated with a lot of us that night since Jesus was truly present in the Eucharist, and we all recognized the necessity of God in our lives. And looking at various comments on YouTube videos after the fact…it seems as though this was many people’s favorite moment/song through all of World Youth Day. And I agree! This scene is especially striking to me because here we have a famous Christian music artist and worship leader on his knees facing Jesus literally and singing to Him literally…and focusing on Him literally…yet at the same time leading the 3+ million of us to do the same. At slightly higher elevation is Pope Francis, the successor of St. Peter, sitting and adoring in reverence with his helpers kneeling…all of them before Jesus elevated above everyone else. Without a doubt, with everyone facing towards the Eucharist, the focus was definitely on Jesus. It makes it easier to worship and focus on our Lord when you can see Him. Even if I didn’t know what was going on…to see Matt Maher kneeling as if facing something (not the crowd)…I would begin to ask what it is exactly (or rather, who) he is facing and why? Maybe the YouTube video doesn’t convey the profoundness of singing this song to Jesus while kneeling…maybe this blog post doesn’t even convey that…but, I assure you, as a first-hand eyewitness to these moments…this experience was profound but … normal to me. This was profound to me because I was sharing this moment with surrounded by, truly, the universal Church from all over the world. And to kneel there together adoring Christ, recognizing my need for Him…I couldn’t help but be grateful for the gift of spending that hour adoring Him with humility. But this experience at World Youth Day was also normal for me because I’m a fan of Matt Maher, and I listen to his music often (maybe just a few days earlier I saw him live in concert in Rio de Janeiro). And I often go to adore Christ in the Eucharist on my own, usually after work or before/after Mass. And sometimes I go to Adoration where there is some sort of music leader leading adoration, praise, and worship. But…as cool as it is do have Adoration done this way with song, with the Pope, with other people, etc… my favorite way to adore Christ is in silence, usually in an empty-but-open Catholic church. 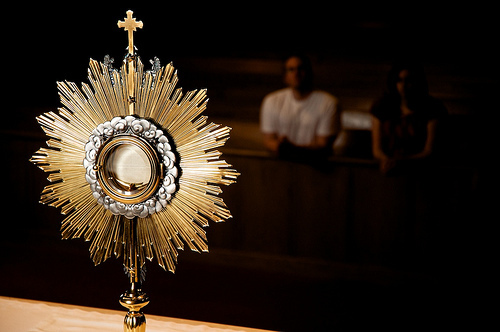 There’s a greater profoundness spending that time with Jesus truly present in the Eucharist when it is just Him and me in silence, free from the distractions of other noises and other people. And I mention this because I’m at a point in my journey of faith that I don’t require music to be playing in order to praise and worship our Lord. And though Adoration is a form of worship of Jesus for us Catholics…I think it’s important for us Catholics to know that Adoration is possible without all the bells and smells of a setting like this experience at World Youth Day or at retreats. Anyway, don’t get me wrong… it is still very much a good thing that our worship leaders and favorite Christian music artists, and choir ministers lead us in praise and worship of Jesus in our churches. But I think to do that before our Lord, truly present, brings about a deeper and more profound sense of focus and really helps us call to mind a deeper sense of why we even sing to Jesus in first place. Lord, I need You, oh, I need You. Every hour I need You. My one defense, my righteousness. Oh God, how I need You. Next Next post: This Religious Sister Has Got Kicks!